Welcome to Earth Overshoot Day 2017. August 2nd is the earliest Earth Overshoot Day ever. Today is the day when humanity’s consumption of natural resources officially surpasses the planet’s ability to replenish them in one year. The good news is that the time frame for this special day has slowed its march back through the calendar. It is still coming earlier each year, but the number of days earlier has slowed since 2011, even while global economies continue to grow. The bad news is that we’re still using 1.7 times more food, timber, water, land and other ecological services than this Spaceship Earth can support. Earth Overshoot Day is a measure of how well we are getting along with the planet. It signifies that humanity is not acting in a way that supports the continuation of our civilization. If we manage to eliminate Earth Overshoot Day by reducing the amount of the planet’s resources we use and waste, then we are supporting the mechanism and systems that promote our continuation. 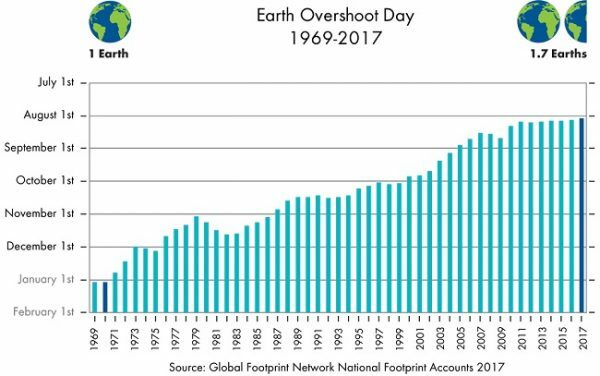 This year’s record early Earth Overshoot Day indicates that we are not saving ourselves from ourselves. It is our goal to recruit one billion crew members. That is, people thinking, acting and living as active crew members… aware of their use of the limited resources we have on Spaceship Earth. If we can do that, humanity will save itself from itself. Market demands will skew toward renewable resources. Political leaders will listen to the will of the people. Become a crew member by adopting one of the behaviors we have listed here: https://thisspaceshipearth.org/get-involved/acting-as-crew/ By taking that one step, you will embark on a journey toward a future when Earth Overshoot Day is no longer an annual event.